This local eatery is very popular among locals and always packed. You start with a pita (white or whole wheat), which is going to be stuffed with yummy ingredients. The basis is fried eggplans, egg and potato. Beyond that, you can add hummus, tehina, egg, parsley, onion, chopped cucumber and tomatoes and spicey sauces (like amba: a spicy sauce based on mango) - and no meat. we recommend to take all of it, as everybody does. You can take some pickles from the counter (refill is free). 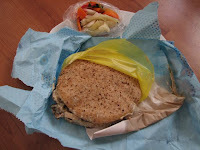 The sabbich is such a hit in Israel that almost every hundred meter in the city you can find one (look for Hipo Organic Food on this blog for another tasty sabbich). As an Iraqi dish which was brought by Iraqi Jews to Israel, some still argue on the authentic meal and what it should contain - the potato, for example, belongs to the new version. Anyway, we believe the one on Frishman is the top notch sabbich and combine the ingredients in the best way. Just for you to know, after eating one sabbich, you are full for hours. It's good if you don't feel like cooking dinner or you are planning a long day trip. If you mind calories - sabbich is around 800 calories, so fight the temptation to take another one right after. If you think you won't like the sabbich, try the crispy fresh falafel of Frishman. This falafel stand is located right next to the sabbich. The delicious taste of the fried potato roll which they add to the falafel which will seduce you to come again soon. 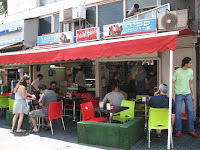 Go on Dizengoff till the crossroad with Frishman, which is next to the Dizengoff square.